Welcome news from Jim Evans at SuperYachtsMonaco that he has closed on the sale of the 50m fast superyacht support vessel Umbra with Russell Crump at Yachting Partners International acting for the buyer. Built by Damen in 2010 to Lloyd's class, Umbra is one of the yard’s Sea Axe series of motor yachts and accommodates up to 18 crew in nine cabins. 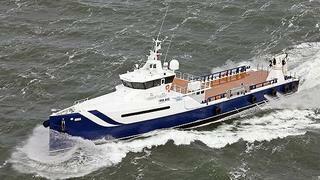 No less than four 1,770hp MTU engines give her a cruising speed of 16 knots and a range of 4,000 nautical miles. Described as ‘a very lightly used Damen Sea Axe yacht support vessel, which has been heavily customised for use by an experienced yacht owner’s fleet’, Umbra features ingenious innovations such as removable accommodation pod and storage containers to suit the yacht owner’s requirements. Fitted with zero-speed stabilisers, Umbra was asking €10 million.